Multicam Logger is a new application from Softron Media Services that allows a user to log all of the different angles (or inputs) used in a live multi-camera production. It records which input the producer has selected on his vision mixer and when. Multicam Logger thus creates a multicam clip for Final Cut Pro X, Final Cut Pro 7 and Adobe Premiere Pro using the logs and the files recorded by any type of video recorder. The purpose is to use the resulting media to edit a final version of the production which could include necessary. Multicam Logger can integrate with ANY production switcher through GPI, but for easier operations, it has been designed to interface directly to the Blackmagic Design ATEM Production Switcher Line through Ethernet. The inputs on the ATEM Production Switcher appear immediately on the Multicam Logger screen and connect through a simple Network Connection, no need for complicated cabling and you can use any of the ATEM Production Switcher line. Selecting a device on the ATEM automatically selects it on Multicam Logger and vice versa, selecting it in the Multicam Logger application immediately selects the appropriate ATEM input on the switcher and retrieves the name of the different inputs from the ATEM. The clean and easy to use interface indicates which item is currently selected as Program and which is selected as Preview. Multicam Logger does not record any video and is hardware agnostic. What Multicam Logger does is log the angles that the producer has selected on his vision mixer when producing a live show. To get to the multicam clips afterwards, it is necessary that you have the capability to record each of the cameras on set and ideally the program output as well. To record each camera feed, the user can select whatever solution is appropriate. After the Live production, to create your multicam clip, you simply drag and drop each recorded file(s) to each camera angle in Multicam Logger. For example, during your live show you recorded the Camera 1 feed using MovieRecorder which created a video file named MyLiveShow (Camera 1).mov. 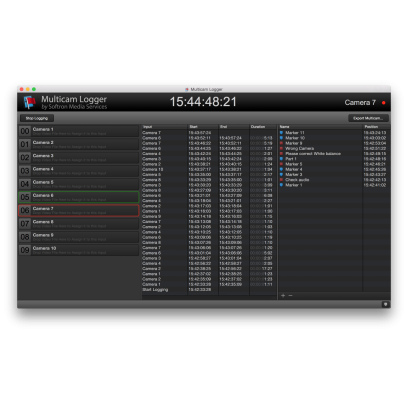 Simply drag that file and drop it on the Camera 1 line in Multicam Logger. This file will now be associated with that angle. You can also simply add Markers and To-Dos that will then be added to your project sequence, so you can log all the important moments or the moments that need to be reworked.